Dr. Ravin Jain was born in Clifton Forge, Virginia and grew up in Houston, Texas. He received his high school degree from the Phillips Academy in Andover, Massachusetts. He attended Northwestern University where he graduated Phi Beta Kappa with a double major in geology and integrated sciences. He received his M.D. degree from the Baylor College of Medicine in 1992. At Baylor, he was a recipient of the Presidential Scholarship. Dr. Jain served as an intern in internal medicine at the University of Texas Health Science Center in Houston. His neurology residency was done at the UCLA Medical Center in Los Angeles, California. 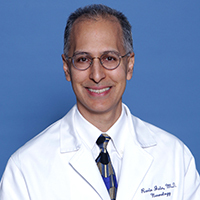 He also completed a fellowship in Clinical Neurophysiology and Neuromuscular Disease at UCLA. Dr. Jain is certified by the American Board of Psychiatry and Neurology (ABPN). Dr. Jain also serves as Assistant Clinical Professor of Neurology at the UCLA School of Medicine. When Dr. Jain is not practicing neurology, his interests include tennis, golf, basketball, hiking, and raising his three year old twin boys. As a neurologist, Dr. Jain is highly trained to treat disorders of the nervous system. This includes diseases of the brain, spinal cord, nerves, and muscles. Some of the more common problems that a neurologist will diagnose and treat are strokes, epilepsy (seizures), headaches, dementias (Alzheimer's disease), multiple sclerosis, Parkinson's disease, and various forms of pain. He may serve as a consultant to other physicians as well as provide long-term care to patients with chronic neurological disorders.